For various reasons you might need to have a planned cesarean section (c-section). A c-section is the delivery of a baby using a surgical procedure preformed by an obstetrician. There are various reasons you might need to have a c-section. Most health care professionals will say you need a c-section if your baby is breech (bum first). A lot of women have c-sections with their second baby if the first needed to be born via c-section. Often times, if your baby is in some type of distress during birth, for example if the heart rate drop suddenly, or is not able to be born vaginally, you might need to have a c-section. 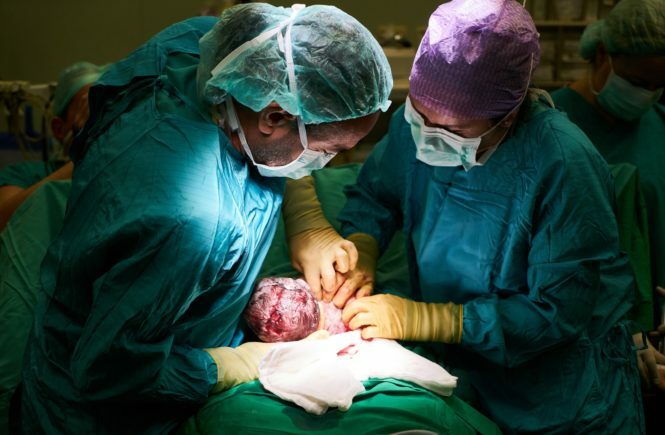 Sometimes, women specifically request a c-section because they don’t want to go into labour. It will be up to the health care provider whether or not this is a possibility. In this blog I’d like to discuss the process of what typically happens during this surgery, so you can feel more comfortable going into it if that is your route of delivery for your baby. This is part one of two posts. The second one goes over what exactly happens in the operating room. Who is in The Operating Room? There will be multiple health care providers in the operating room and it might be helpful for you if I clarify each persons role. Most often each health care provider will introduce themselves to you and your family, but sometimes things can get hectic and that is not possible. Below I will describe the different health care providers that will be involved in your care. This nurse takes care of you during the procedure. He or she will ask you questions about your pregnancy and health history. They will start your IV and give you any medication you might need before the surgery. They are your advocate and helper throughout, so don’t hesitate to ask them anything! The circulating nurse is your resource person in the operating room. There may be times where the nurse is busy helping the doctors and other members of the team, but they are never far off. Once in the recovery room, they do all the regular nursing tasks such as vital signs and assessments to make sure you are stable after the surgery. Some hospitals have a different nurse before, after and during the c-section, but regardless, the above information is true whether or not it’s the same nurse. This nurse is scrubbed in and sterile during the surgery and is behind the drapes with the doctors. She or he will hand instruments and whatever else needed to the doctors and help them during this sterile procedure. The anesthesiologist is the doctor that will be closest to you during the procedure, he or she takes care of giving you all the medication you’ll need, in addition to being responsible for pain management. The pain management is usually in the form of a spinal that will be explained more thoroughly later. They are technically “in charge” of the surgery, nothing starts until they give the OK. If it’s a booked c-section, most likely your own obstetrician (or OB, that’s the fancy name for pregnancy doctor) will be there for the surgery. In addition, there will be an assistant, which can be a resident who is a doctor training to be an OB, or any other surgeon. They help each other out during the surgery and make sure your baby is delivered safely and you are put back together properly. Depending on the hospital, another professional will take care of the baby after delivery, just to make sure everything is alright and your baby is transitioning normally from the womb. If not, they will take care of resuscitating your baby after the delivery. Some babies have a harder time breathing on their own right after a c-section. This is because the mucus in their lungs isn’t squeezed out in the same way as it can be during a vaginal delivery. That is why it is important to have a dedicated health care professional taking care of the baby. The baby nurse will do all the measuring and weigh your baby as well once baby is breathing on their own. You will be allowed to have a support person by your side during the c-section. It is up to you who you choose. Some facilities allow more than one person. Most often your husband or partner will be the one supporting you, but again that is your choice! Find out ahead of time what your hospital’s policies are. If you have a doula, you can ask whether your doula is allowed to be present along with your partner. If you’re delivering at a teaching hospital, you might be asked to accept students into the operating room. There could be nursing or medical students, or other professionals that need to be present for their learning. It will be up to you whether or not you allow this. Remember, it’s your birth, so advocate for yourself or get a loved one to speak on your behalf. Usually, your c-section will be booked for a certain time, for example 8 am. Some hospitals will have some sort of pre-registering appointment as to prepare you for what lies ahead. Other hospital just tell you when to show up and go from there. Typically you are asked not to eat or drink 6-12 hours before the surgery, this will vary depending on the hospital you are delivering at so be sure to find out what the regulations are. If you happen to eat when you are not supposed to, your c-section will be delayed. The reason for this is that the anesthetist might have to put you to sleep (don’t worry, it’s not really that common) and if you’ve eaten, there can be complications to that procedure. That being said, even if you c-section is scheduled for a certain time, you might be delayed anyways. If the hospital labour and delivery floor is very busy, there will be a delay because of lack of nursing staff or lack of space in the OR. This can be very frustrating since you probably haven’t eaten for a while and might be feeling anxious. Just know that it is out of your hands and the reason you’re waiting cannot be controlled! It might be a good idea to pack some distractions like cards, books or movies, just to take your mind off the situation. Or if you have a cozy spot to wait, have a nap! You know you’re not going to sleep for a while after the baby is born. The next post will go into to details of what happens during and after the c-section, so stay tuned! Please don’t hesitate to contact me with any question regarding this topic or any for that matter!